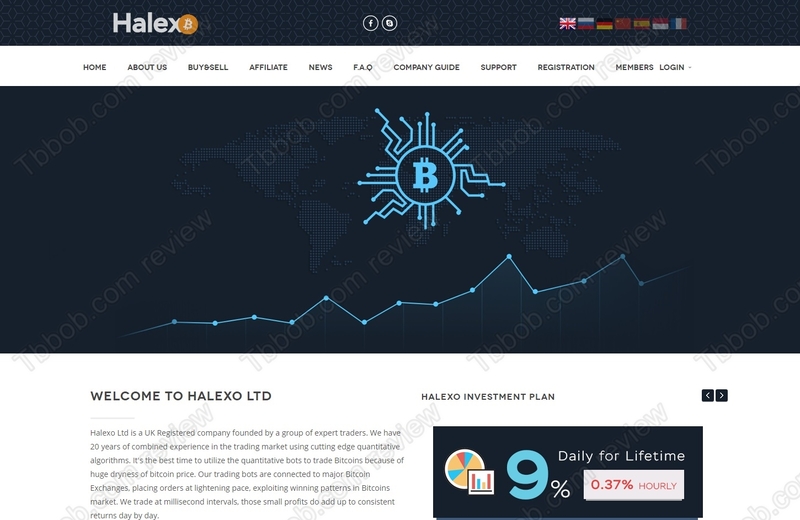 In this review we have a look at a new cryptocurrency scam called Halexo. Halexo Services Limited claims to be a company founded by a group of expert traders who are using quantitative bots for Bitcoin trading. For whatever reason Halexo is allegedly willing to share its profits with you, you just have to deposit and then you will be paid up to 9% daily forever. So, is this investment opportunity real? The truth is that there are no expert traders at Halexo, in fact, there is no real cryptocurrency going on, because it’s just a scam. Any time you see such an offer with high returns and a referral program, you can be sure that you are dealing with a Ponzi scheme. 9% daily means 270% monthly, which is very high, and Halexo would have to be doing even better, because they won’t share their profits with you for free, right? In reality Halexo is a Ponzi scheme, which means they are collecting money from the public and using money from new deposits to pay profits. As you can imagine, such a scheme is doomed to fail and it will fail, the question is just when. Either the owners will close it whenever they choose to do so, or when they are forced to do it because withdrawals exceed deposits. Halexo has a pretty presentation, they say that they are a company from the UK doing legit business. But it is not true. The company is only three months old and it has only a tax registration, which is very easy to get. There are two problems. The first one is that in the Company Guide they show a stock photo claiming that it is their CEO. So, they lie. The second one is that Halexo is clearly providing investment services, which is a regulated activity in the United Kingdom, so you must have a license for that. But Halexo has no license whatsover, so it is an illegal operation. Halexo is a scam that is going to collapse, it is just a matter of time. Stay away from it! If you want to see what profits are really possible in cryptocurrency trading, try a free demo with a regulated broker. And remember, trading is risky, you can make, but also lose money.